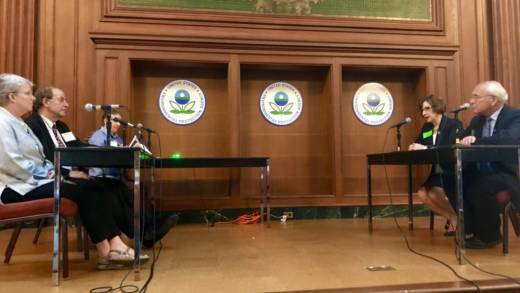 Critics at a public hearing Tuesday sounded off on the Environmental Protection Agency's plans to limit the use of scientific research in drafting new regulations. Opponents of the draft rule — who ranged from congressmen, former health officials and scientists — voiced their concerns at the agency's Washington, D.C. headquarters this morning at a hearing that's expected to last all day. Critics urged EPA officials not to adopt a measure that they say would jeopardize the health and safety of Americans by excluding critical research that can lead to stronger environmental protections. Those expressing their concerns Tuesday include Gretchen Goldman, the research director at the Center for Science and Democracy. Unveiled in April, the draft rule — "Strengthening Transparency in Regulatory Science" — would bar the EPA from considering scientific studies that "are not publicly available in a manner sufficient for independent validation," according to the text. At the time it was revealed, former EPA chief Scott Pruitt said it would make the agency's decision-making more transparent. But critics like Jennifer McPartland, a senior scientist with the Environmental Defense Fund, say the rule is a disguised attempt to bar consideration of research that could lead to tighter regulations. "The data underlying many scientific studies are not publicly available and cannot be made publicly available," McPartland told EPA officals. Acting EPA chief Andrew Wheeler has indicated in interviews that he would pursue the draft rule. Those who oppose the rule argue that it's not always feasible to make data public. "The data underlying many scientific studies are not publicly available and cannot be made publicly available," Jennifer McPartland, a senior scientist at the Environmental Defense Fund, told officials. That's because such a move could compromise patient privacy and the personal data of study participants. "If those [confidentiality] documents say we will be required to release your private information to the U.S. government or to the public, [people] would be wise not to participate,” Peter Thorne, a toxicologist and former chairman of EPA’s science advisory board, told Science Magazine. Thorne was removed from the board in late 2017, when his membership wasn’t renewed by Pruitt. Research that has shaped EPA decision-making includes a groundbreaking air pollution study by Harvard scientists which found a strong link between death rates and dirty air in several major U.S. cities. The findings led to tighter air-quality rules. Others at the hearing, however, urged the EPA to adopt the controversial rule. Among those expressing their support include Dan Byers, vice president for policy at the U.S. Chamber of Commerce's Global Energy Institute. GEI's @DByers21 testifies before @EPA in support of proposed rulemaking on strengthening transparency in regulatory science. "Federal rules that impact millions of people and billions of dollars should be held to a higher standard." A 2015 review by the Congressional Budget Office pegged the initial cost of implementing the rule at $250 million per year. A cost-benefit analysis conducted by the EPA in 2011 found that programs established under the Clean Air Act yield direct benefits to the American people which vastly exceed the cost of compliance. Specifically, the study found that for 2020, the maximum estimated benefits derived from clean air programs exceed costs by 90-to-1, while the lowest estimated benefits exceed costs by about 3-to-1. The proposed rule is open for public comment until August 16.